This is a rare late 19th century fully complete blood transfusion embalming aspiration kit. 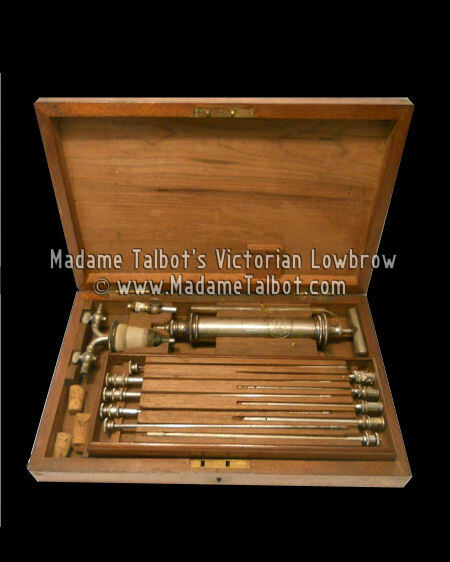 It comes in original fitted wood box which measures 11 inches X 6 3/4 inches X 1 3/4 inches, with a wood pull out section that contains the needles and fittings, & underneath is the hose and more fittings. This kit was made by Down & Brothers in London England and comes with original brass key and working brass lock, has original two locking clamps on each side, all secured with original brass screws and hinges.